I first spotted The Bees Knees succulent terrariums hanging in the window of a local shop. Multi-textured green leaves spilled out of tear-drop glasses dangling in the sunshine – how lush and beautiful they were! I eventually met the creator, Ashley Bentley, and spoke to her about her pieces of living artwork and what inspires her to make them. 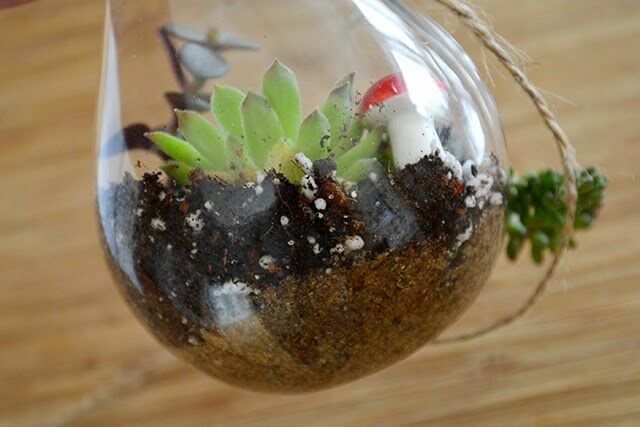 Ashley has been kind enough to share how she makes her succulent terrariums. 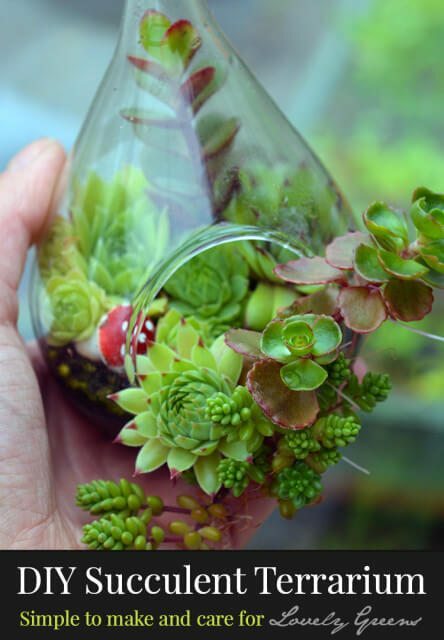 It’s an easy-to-follow set of directions using succulent cuttings, cactus compost, glass terrarium and a few other materials and tools. 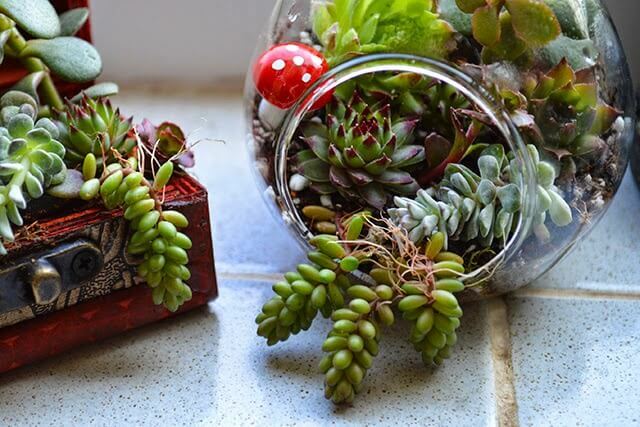 Ashley first spotted succulent terrariums over a year ago on Pinterest and decided to try making them for herself. The main reason she tried in the first place is that ready-made terrariums she found online seemed so expensive. Since then she’s made dozens for herself and even more for others. Though she doesn’t consider herself a Green Thumb she says that working with succulents is forgiving and that anyone can do it! Once made, they’re incredibly easy to take care of and will grow for years before needing to be replanted. Sand – beach sand, building sand, Pink sand, Blue sand any non-toxic sand works! 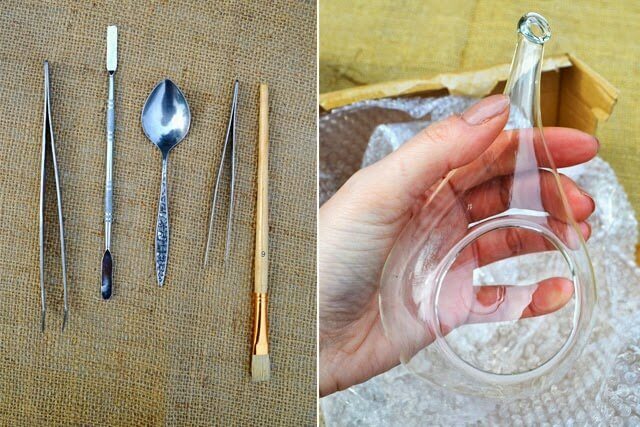 Most of the items you need for this tutorial can be found in many homes and gardens. 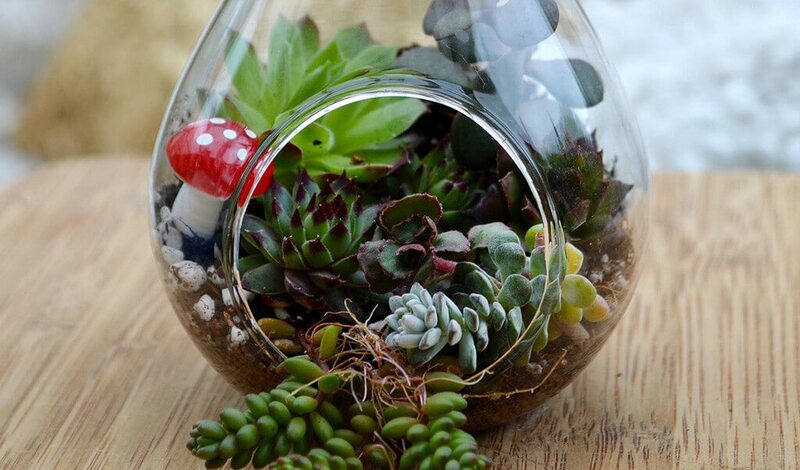 Instead of the purpose-made glass terrarium you could use a mason jar or empty food jar. It just needs to be clear and with an opening for ventilation. The sand can be taken from a nearby beach, the tweezers and spoon from the bathroom and kitchen, the paint brush from your art supplies, and the succulents from planters outside. If you have an aquarium you might even have the activated charcoal since it will be used in the water filtration system! Succulents are tough plants that require very little in the way of soil, soil nutrients, or even much water in the winter months. If you spot some growing in a park or other public place you could even be a bit cheeky and nip off a few pieces to take home. They root very easily and the small amounts you take won’t hurt the parent plant. For this project, Ashley used garden centre succulents and wild Alpines she found growing on the stone wall outside her home. Take about ten to twelve small cuttings of succulents. You’ll want a few that can trail over the edge of your container, a few that can be larger focal points, and others for varying colour and texture. 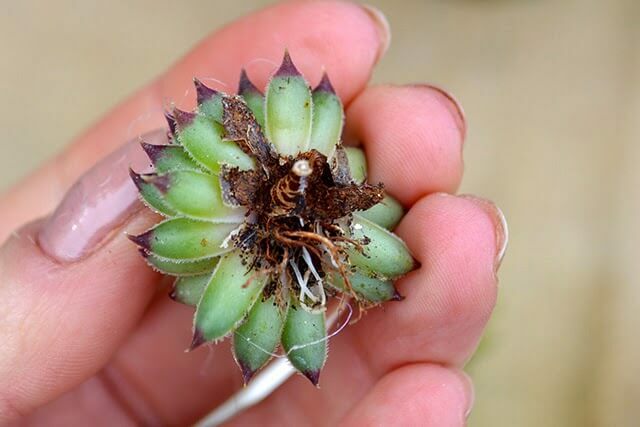 You might think that many succulents will outgrow your terrarium but because of the limited soil they shouldn’t get too large, especially if you trim them as they grow. Once you have your cuttings, allow them to sit in a cool place out of direct sunlight for a few days. This will allow the broken ends to callus over which is a required step if you want the succulent to form roots. After these few days, you can proceed to step two. In the bottom of your glass container, layer about half an inch of sand, pushing it up in the back to form a hill. Over the sand, sprinkle a very fine layer of the charcoal. The sand creates drainage for excess water and the charcoal ensures that mold, moss, and any uninvited micro-organisms do not grow and take over the planter. I’ve listed this step separately in case you’d like to make your own mix. Cactus potting mix can be purchased online or from a garden centre but it’s possible to create it at home too if you have the materials at hand. 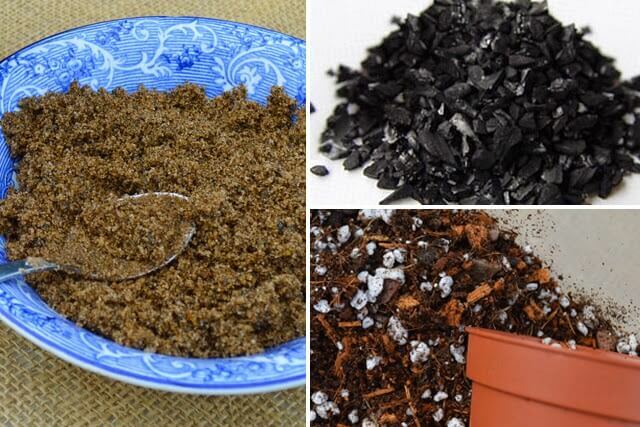 It’s a mix of 50% washed cocopeat, 20% 5mm Coco Husk Chips, 20% Perlite, and 10% Horticultural Grit. Layer about half an inch of this potting mix on top of the sand and charcoal and make sure to mound it up at the back like you did the sand. Spray the potting mix a few times with the spray bottle you filled with ordinary tap water and you’re ready for step four. Now is the creative part! Place your cuttings into the potting mix and arrange them so that the composition suits you. Ashley recommends putting taller pieces into the back and pushing them in with the end of a spoon or paintbrush so that the end with the callus is well covered. Next, put any large pieces inside and push them in. It helps to put the trailing pieces in before any of the foreground succulents since it might be difficult to get them in otherwise. Once all your succulents are in you’re finished! The cuttings may take a few weeks to develop roots so try to keep the terrarium in a bright area where they can form without disturbance. For aftercare, the succulents will generally only need to be sprayed with water once a week or so. Each time you water them, ensure the potting mix is damp but not soaking and allow it to dry almost completely before watering again. For more succulents care, visit this link. You might also find that over time, the succulents may become a bit leggy since they’ll be trying to find more space to grow. Just cut these leggy pieces off and re-pot them outside or in new terrariums! Ashley retails her bespoke terrariums at very reasonable rates through her Facebook page. 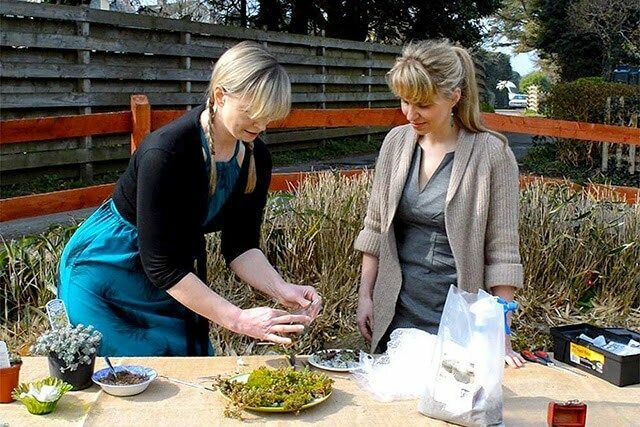 If you’re outside the UK or Isle of Man or would just like to try making your own, she’s been gracious enough to show us how to make them. This looks very nice. But: you should never plant indoor- and outdoor-succulents together. They have different needs and one of them will eventually die. Sempervivum (hen and chicks) and sedum are outdoor plants that need the weather while crassula (Jade plant) and echeveria like to be in the house. Never say never when it comes to gardening. These plants grew successfully for a year before I repotted them on. All did very well together, as do all the succulent terrariums that Ashley makes and retails. My jade has no clue it likes to be in the house. It’s been growing successfully for over a decade outside alongside the hens and chicks and sedum and cacti and lithops and all the rest. I bought a “garden tile” of sedum plant that I want to use for terrariums. It is already growing in the “tile” base which looks very nursing. These tiles can be cut and used anywhere. I think I won’t need extra soil but will put the layer of sand and charcoal down first. I’d like to know if anyone has tried this type of succulent for a terrarium. Thanks. Am going to test one today and see how it works out over the next few weeks. Also, does anyone know where to get reasonably priced jade plants? I live in the Denver area. I teach gardening. Master Gardener. 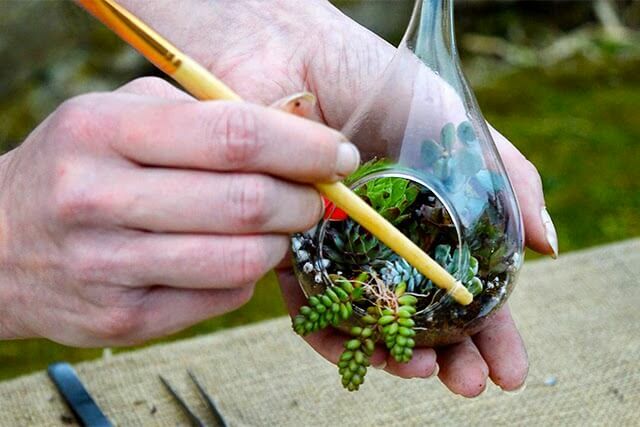 Terrariums are closed to allow the plants to create their own environment. I call this an open planting. It is a very attractive.